Why are coins important to archaeologists and researchers? Learn about how currency evolved from commodities like shells, knives, spades and barley to standardized forms of coins like Greek coins, Chinese coins and modern coins. 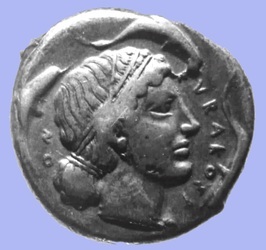 IMAGE: Arethusa tetradrachma, Magna Graecia, 450 BCE. Redpath Museum.